Home » Columns » Abracadabra By K. B. Ganapathy » Gone Away: To Germany & Austria-10: Our own Cafe Coffee Day and Mysuru family in Vienna! 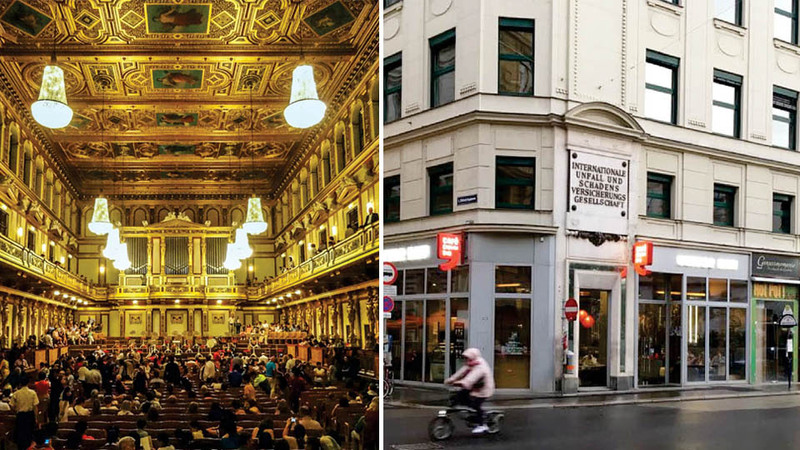 Gone Away: To Germany & Austria-10: Our own Cafe Coffee Day and Mysuru family in Vienna! Having done with the Palace for almost a day, we visited some Churches and Museums as a routine but the evening was special for us. 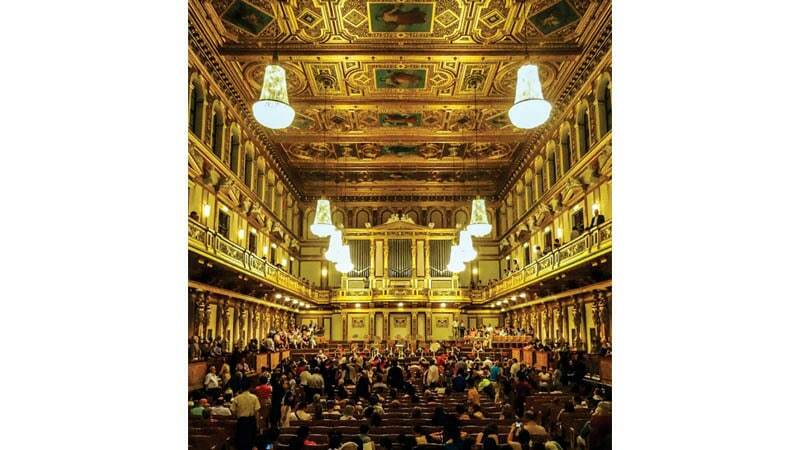 We had booked expensive tickets for the concert — Vienna Mozart Orchestra at 85 Euro per ticket (Rs. 6,545). It was boring for us, not used to this kind of music but the Music Hall is of its own class (see pic.1). Pic 1. The imposing Music Hall at Vienna. However, there was compensation enough for us for that evening when we were taken by surprise seeing our own Cafe Coffee Day. “O, Siddhartha, son-in-law of our own former Chief Minister S.M. Krishna, here we come,” screamed each one of us in silence and walked in (see pic.2). For the first time in nearly 10 days, our mouth started watering seeing hot samosas with chutney, that we washed down with Indian coffee even as its aroma set our nostrils flapping like bellows. Thank you Siddhartha. You are also our country’s ambassador in a commercial way. While people like me spend country’s precious foreign exchange, you bring foreign exchange to our country. We kept apart the whole of the following day for shopping — when women are around can shopping be avoided? 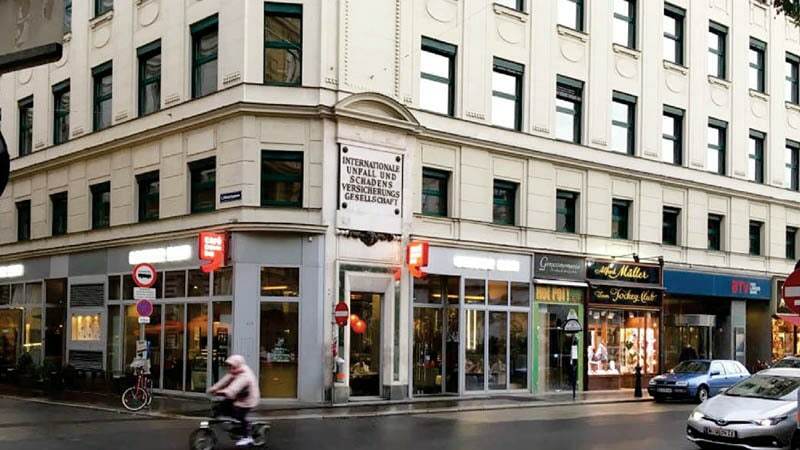 That too in a city like Vienna? The world’s all the best and branded products were there. You name it and all that you have to do is to find where the shop is. Walking and walking and more walking, my old legs under the care of my friend Dr. N. Nithyanand Rao, gave up. I asked to be dropped in my hotel, my comfort zone in Vienna. But ladies said, ‘Only five minutes’ and went on and on with me limping and halting here and there. The moment I saw a bench I would sit down. Pic 2. Cafe Coffee Day. 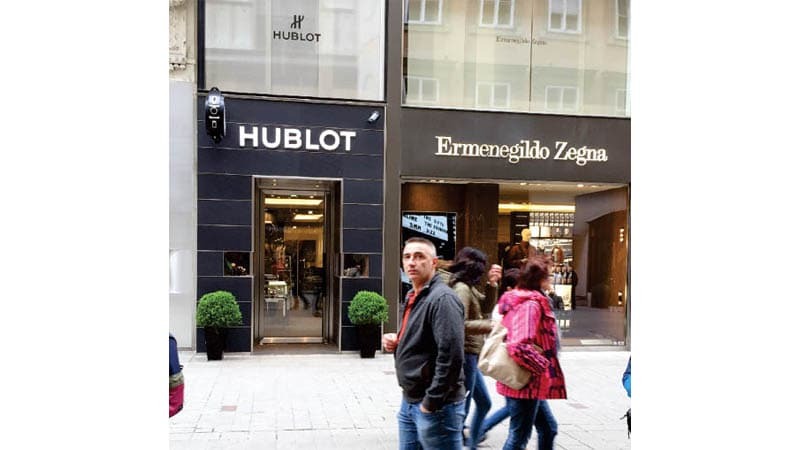 But then, it was all for good I thought when I saw a shop “Hublot” (see pic.3). Remember the name? That was the wrist watch our Chief Minister “for the poor, of the poor” Siddharamaiah was caught (or was it found?) wearing last year. The watch costs nearly Rs. one crore!! Being a humble middle class person, I must perish the thought. Let it be. Pic 3. Hublot showroom in Vienna. And as we moved on, there was this display board in a shop showcase (see pic.4). 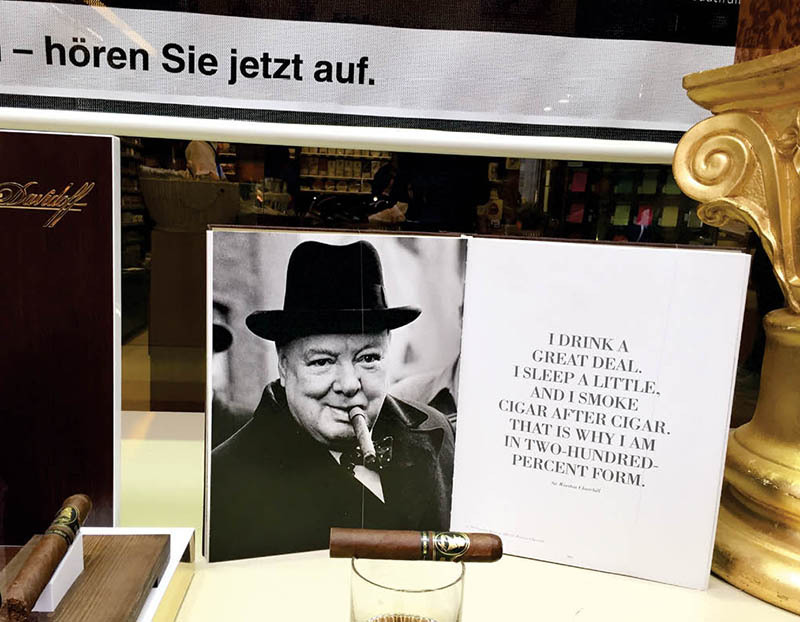 It is Winston Churchill the legendary World War II hero and Prime Minister of the United Kingdom known for his love of alcohol and cigar. The text says, “I drink a great deal. I sleep a little. And I smoke cigar after cigar. That is why I am in two hundred per cent form.” It is a great reassurance and hope for those who drink and also smoke. Their 200% form is assured! That is the good news I bring to my friends here who drink and smoke. And our last day in Vienna before taking our train to Munich in the evening. It was reserved for a luncheon party at a small town restaurant attached to a vineyard. It seems Vienna is the only metropolis in the world with vine gardens within the city limits. 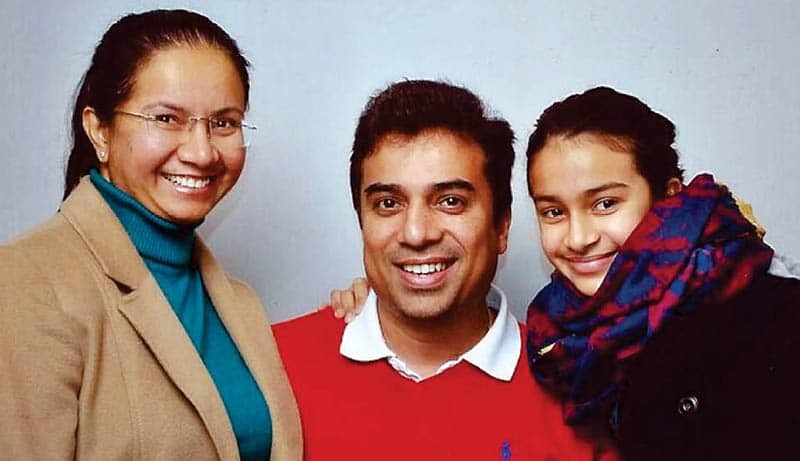 However, our luncheon party was on the outskirts of the city (Heuriger Wolff Rathsrassee) and by arrangement our host Mohit Bopanna with his wife Veena and daughter Ria Bopanna (see pic.5) arrived there within 15 minutes of each other, we making it first. And this early arrival enabled us to survey the vine growing estate at the back of the hotel that extended beyond the hills (see pic.6). This couple were earlier working at an IT company in Nanjangud, Mysuru and on being transferred to Vienna stayed put there. Mohit Bopanna with wife Veena and daughter Ria. We spent a few hours of quality time remembering our old friends and contacts back home and those who left the home and hearth, like Bopanna, to graze on the new pastures and, of course, return to sweet home when enough money is made or not at all. Many get back to their roots. After all, East or West, home is the best because here nobody will ask you: From which country are you? Why don’t you go back to your country? Unfortunately, in our own country time has come to ask some pseudo-secularists, some fanatical minorities and extreme liberal leftists questions: Do they know this country is already overpopulated with 130 crore people? Do they want this country to be filled with Pakistan supporters, Kashmir Valley stone-pelters, immigrant Rohingyas and Bangladeshi Muslims? And one day they are sure to make the local people strangers in their own country. Like Kashmiri Pandits now living in Delhi refugee camps. Be that as it may, the next day we took the train back to Munich arriving in the evening. Before I forget. We spent two days in Munich and about it later. However, after a week I learnt that the conservative “whiz-kid” 31-year-old Sebastian Kurz of Austria had won the snap poll, which he had forced, on the question of Syrian immigrants, heavy taxes and red-tape. Understandably, not corruption. If corruption were to be a question in our country, then we will have a forced poll every two years! Mozart orchestra , boring? Best then, not to visit a Western country. Vienna visit is never complete without seeing where the great composers lived and worked, and the dancing horses. The interesting aspects of Vienna: the emergence of opera and concertos and the luminaries like Mozart and Bach, and their lives in that City, Spanish Riding School and the dancing horses there, and the Documentation Centre of Simon Wiesenthal, the late Nazi Hunter, who brought to justice a few Nazi criminals responsible for the Holocaust, particularly the captures of Adolf Eichmann who was hiding in Argentina and his trail in 1960s in Israel where he was placed in a bullet proof glass chamber in the court there, and the trail was broadcast all around the World then. Ofcourse, the famous coffee shops there. Hot samosas? Indians look back at home even on their foreign trips. Why do this trip then when samosas can be eaten plenty in Mysuru?